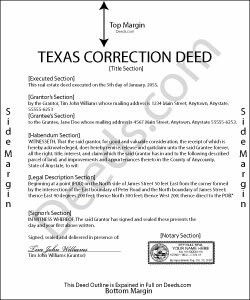 In Texas, a correction deed is the deed issued to make changes to an erroneous deed, referred to as the corrected deed. These two instruments are closely linked, and all corrections are effective as of the date of the original recorded instrument (Property Code Sec. 5.030). Texas Property Code distinguishes between material and non-material corrections, giving specific examples in each category. Non-material changes are generally clerical in nature and include additions to or corrections of: party names and marital status; elements of the property description, such as, an error in a metes and bounds description or incorrect acreage; the recording date or reference data to an earlier instrument; a missing or defective acknowledgement. All these corrections can be made by persons other than the parties of the original instrument, as long as reasons for the correction and knowledge of the facts corrected are stated and evidence of notification of the original parties or their heirs is provided (Property Code Sec. 5.028). Material corrections, on the other hand, can only be made by the original parties or their heirs and must be executed by all of parties involved. Such changes include the addition or removal of land, disclaimers, a mortgagee's consent or subordination to a recorded instrument, and changes of lot or unit number (Property Code Sec. 5.029). A Texas Supreme Court decision from 2009 also specified the addition or removal of mineral rights as among the material changes that can only be made by the original parties. In some areas of Texas, it has been common practice for the attorney who made the error to correct it through a scrivener's affidavit when the parties are not available and the error is only minor in nature. This type of correction is ineffective when a title company employee makes it or when it is made to a certified copy of the original instrument. Only when the parties initial the changes and sign a statement why they are being made is the correction of a certified copy acceptable for recording, but even then, can it be only made for the types of errors specified in the statutes (see above). It is always advisable to check with the local county recorder. James C. said: An excellent resource for users.